Welcome to our Bindery Video Collection! Follow these step-by-step directions for assembly of your new CreaseStream Mini Desktop Scoring Machine. 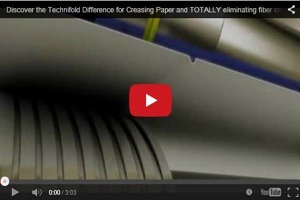 This instructional video demonstrates unpacking and assembling of your new Technifold Desktop Creasing and Perforating Machine. Check out this creative bindery equipment rig that reduces separate saddle stitching and tabbing operations to one high-speed operation. Using hot-melt glue to successfully glue a UV coated cover to a book block is nearly impossible. Here's how one bindery saved a long-run job by removing the coating at the spine. How one perfect binding operation dealt with an 'impossible' web press imposition by changing one small thing on their binder! Folded pieces with multiple panels or heavy stocks can be difficult to deliver on some folding machines. Here's a simple, effective tip for handling those problem jobs. It's not pretty...but it works great. Precision scoring, cutting and perforating tools have tight fits on the machine shaft. This simple operator tip demonstrates how to install tools without damaging either the tools or the shafts. A technique for running a cover stock 4-up on a folding machine without having to trim on your guillotine cutter. Simple tactic boosts folding machine productivity with the right tools. Tip for better scoring and folding with bindery equipment scoring devices. One of the main factors in producing a proper score (crease) on paper is correct centering of the crease. This video demo shows how to quickly center the score on any type of bindery equipment using rotary scoring devices, including folding machines, scoring machines, and cover feeders on saddle stitchers and perfect binders. Scoring perfect bound book covers inline, regardless of grain direction, is easy and versatile with the Technifold Spine-Hinge Creaser. Video shows how to change creasing ribs to get the correct crease on any weight of paper stock and demonstrates how to do it from either side of the sheet. Device for Muller Perfect Binders also has infinitely variable female channel width adjustment for precise control of creasing. Be sure to check out our other videos to see more of our amazing tools in ACTION; as well as some amazing Bindery HOW-TO Tips!